Supported by a local Friends chapter, Pickett’s Mill is one of the best preserved Civil War battlefields in the nation. Visitors can travel roads used by Federal and Confederate troops, see earthworks constructed by these men, and walk through the same ravine where hundreds died. An authentic 1800s pioneer cabin is furnished and open for tours during certain events. On May 27, 1864, the Federal Army, having been stopped in its advance on Atlanta two days earlier by the Battle of New Hope Church, attempted to outflank the Confederate position. Some 14,000 Federal troops were selected for the task, and General Howard was given command. After a five-hour march, Howard’s force reached the vicinity of Pickett’s Mill and prepared to attack. Waiting were 10,000 Confederate troops under the command of General Cleburne. The Federal assault began at 5 p.m. and continued into the night. Daybreak found the Confederates still in possession of the field. The Federals had lost 1,600 men compared to the Confederate loss of 500. The Confederate victory resulted in a one-week delay of the Federal advance on Atlanta. 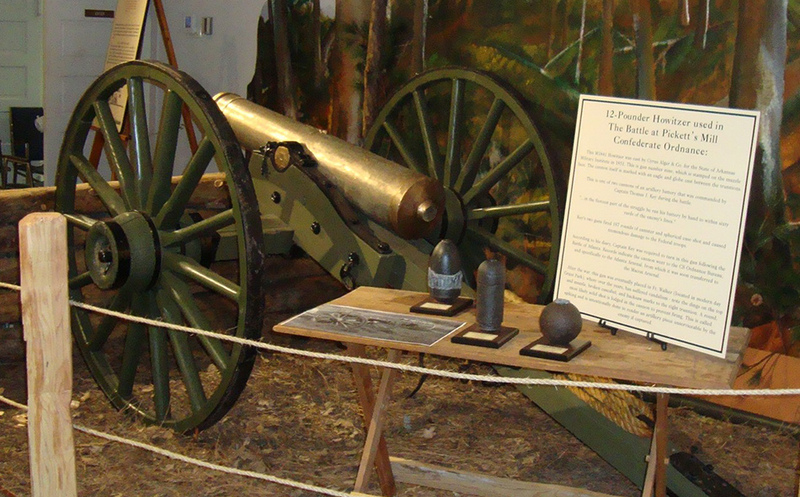 For a full listing of events and information about Pickett's Mill Battlefield Historic Site Historic Park visit the Georgia State Parks page.